Имате въпрос към Pulas Inn? При посещение в Бандунг, в Pulas Inn ще се почувствате като у дома си, защото предлага квалитетно настаняване и отлично обслужване. Този 1-звезден хотел е леснодостъпен, тъй като е само на 2 km от летището. С удобното си местоположение хотелът предлага лесен достъп до всички градски забележителности, които задължително трябва да се видят. Pulas Inn прави всичко възможно гостите да се почувстват удобно. Затова хотелът предоставя най-добрите услуги и удобства. Най-важните съоръженията на хотела са безплатен WiFi достъп във всички стаи, 24-часова рецепция, Wi-Fi връзка в общите части, паркинг, рум-сървиз. Pulas Inn разполага с 8 стаи, които са обзаведени с вкус. Много от тях предлагат удобства като телевизор с плосък екран, безжичен интернет достъп (безплатен), бюро, балкон/тераса, вентилатор. Хотелските съоръжения като градина са идеално място за почивка след тежък и уморителен ден. Когато търсите удобно и комфортно място за настаняване в Бандунг, изберете Pulas Inn, който ще се превърне във втория Ви дом. The price is reasonable. If you are not a fussy traveller, this is good place to sleep in. It's just a simple room. This is not a suitable place if you are too fussy about cleanliness as I found cockroach and blood stain on the bedsheet. The hot water system is very bad and there is no sink. It came with a free alarm clock - 4am prayer from a nearby mosque and car honking before 7am by someone staying in the inn, when I stayed there. The benefits are helpful/friendly staff. Nice breakfast - nasi uduk and nasi kuning. It is walking distance to Rumah Mode. This is a value for money inn. The price is reasonable. If you are not a fussy traveller, this is s good place to sleep in. Nothing fancy about this place. It's just a simple room. Found blood stains on the bedsheet but I did not bother much about it. Found a cockroach but the staff helped to get rid of it. This is not a suitable place if you are too fussy about cleanliness. The hot water system is very bad. What annoyed me was the 4am prayer from a nearby mosque which disturbed my sleep daily and the early morning car honking which I suspected the culprit was someone living in the inn. The good thing was I did not need an alarm clock. The breakfast was great - both nasi kuning and nasi uduk. 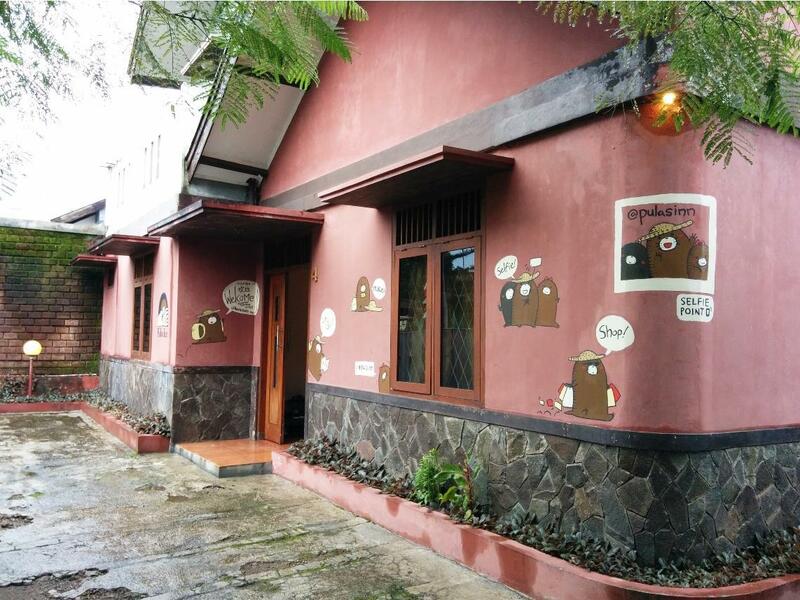 For all backpackers who looking for budget hotel, this suits you. The wifi are good and breakfast also great. The cable tv with various chanels will make you happy after long-day shopping. But the leaking in my room make me felt little upset. Thank u to all staffs who fix it immediately. The pillow lil bit smelly. Perhaps the management will change the pillow for new one. The good thing about this place is the friendly and helpful staff. The breakfast (nasi uduk) is very nice too. The hot water of the shower was not working well. Sometimes, no hot water at all. There is no water basin in the toilet. The toilet looks old. No soap and shmpoo provided. Towel and hangers are provided. If you have heavy luggage, pick the room at the ground floor. Otherwise, you need to carry them to the upper floor which is troublesome. The room on the ground floor is very cold though. Without hot water shower makes it worse. feel not comfortable because the room that i stayed leeking..
We went in groups. At night, we hang out at the lobby and tell stories. It is something that we have not done for a long time. Rooms are all very un down.. paint is peeling away in many areas, I think there's mold too.There's a unpleasant smell when we first entered the room. Toilets are awful with no basin at all. And so we had to brush our teeth in kitchen sink which I was told many guests would do the same! Yucks! And sink is used to wash dishes, plates, mugs, etc which are used to serve breakfast (included in price!). No dining table for breakfast and we had to sit on reception desk facing receptionist when eating breakfast The toilet tiles chosen are black so it's hard to maintain them clean and proper. Was uncomfortable walking on toilet floor. Shower water pressure is poor..No soap or shampoo or anything is provided in the room except bath towels Standard twin room comes with pull out bed not 2 single beds. Nowhere does it say it's a pull out bed for 2 persons, so we were disappointed with that. Pillows itself are dirty and full of stains, and we didn't want to put our heads on it! I wonder when was the last time the pillows were replaced. Good for group travel. Backpacking style. The room is clean, the staff is good, the price is good. It was great, but not for the breakfast part. The price is not too expensive but not too cheap. The room is not too comfort but not too bad. The distance is not too far from jalan cihampelas but not too close too main shops, quiet tired by walk. The breakfast is not too bad. Staff is friendly. friendly receptionist. Good services. Will bcome priority to me if i travel to Bandung again.